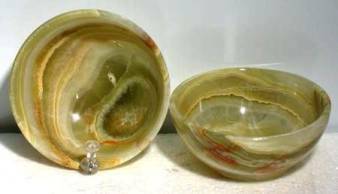 These beautiful green onyx bowls can perfectly suit any circumstance. They can be used upon your altar, for fuctional purposes on the dinner table. They are approximately 3" in diameter, colors vary. Each bowl is unique after all! ALTAR TILE - PENTACLE JAI-CUT 2 3/4"
BRASS ANKH Large 3 1/2" x 6 1/2"